Watch and enjoy. Featuring the songs “Big Milk” and “Wooody Wooodpecker”, by Dan Deacon. 1) This afternoon I filmed a music video with Corey, but the editing of it will not be finished tonight, due to an excruciating migraine that I developed some twelve hours ago and it continues to eat away at my brain. I am very excited to finally find myself picking up the camera again. The footage was fun and will be even more of a good time to edit, which I entirely miss doing. I can say that you will want to check it out upon its completion, which will most likely be tomorrow. It features a song by Dan Deacon. 2) I have officially put an end to the disease of being unable to watch films at home, which I was diagnosed with several months ago. It is unknown as to what the cure to this was, but I am happy to say that I came out of it all without entering chemotherapy. It is a great feeling to be watching some of the films I missed out on lately. 3) In the very, very near future I will have consistent time with an awesome new laptop, which I am confident will help me finally make good on my promise to deliver more frequent reviews on this establishment. I think there’s no betting against the combination of Panera Bread, dark and vibrantly brewed coffee, an XPS laptop, and me. I will make it happen. 5A) Tomorrow, two good things will be happening. Immediately when I wake up I will be going to rent the three films that are seeing new release and that I have been anticipating for months. The one that is most desired is the James C. Strouse-directed, John Cusack-acted, and Clint Eastwood-scored, Grace Is Gone. It was sadly never released at the Keystone Art Cinema as it was promised. The same has also happened with this year’s David Gordon Green-directed Snow Angels, which I will never fully get over. If you know me, then chances are you know that Cusack has always been one of the highest actors on my list, and with this newest role being considered among his best, I cannot wait for tomorrow morning. Another film on the list of three promising releases this week is Woody Allen’s latest effort, another attempt at all-out drama, Cassandra’s Dream. It had a couple weeks of runtime earlier this year at the Art Cinema, but I just couldn’t manage to make it out. Tomorrow I will watch it and give my apologies to the great Allen for missing my first film of his in theaters since 1999’s Sweet and Lowdown. The third film of the trio, and the one I chose to watch as the finale of them all, is Paul Schrader’s The Walker, in which it seems Woody Harrelson gets another chance at a significantly dominant starring role in the vein of Natural Born Killers, and The People vs. Larry Flynt. Perhaps I am saving the best for last? I will soon find out. 5B) Later on in the day I will be going to an interview, which I fully expect to nail in the easiest of ways. Needless to say at this point, I am extremely unhappy with my IMAX projectionist job…or was I extremely unhappy with the IMAX projectionist job that I spontaneously quit? If that question lingers inside your head as you’re reading this, then there is even more reason to watch the music video Corey and I filmed today. The answer is there. Anyway, some new directions will most likely be starting tomorrow, regardless. 6) I have become exhausted with the A-F rating system that I have used on films for the past I don’t know how long. 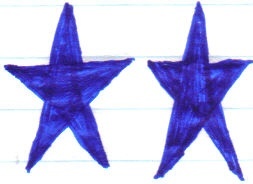 I have reached back to the 1-4 stars that I began with in the very beginning…I’m talking about classic Frankton High School “Fergy Reviews” column days. How has it already been 8 years since journalism class? That’s sort of scary. 7) Last weekend, filming began on the latest full-length Neckbrace Substitute film. I will not reveal much on this under-wraps project, but I will tell you that it is a documentary collaboration with Tony Marshall and an extension of various members of his family. I hope you all will watch when we finish it in July and have it available later that month. That is all that seems to be happening right now. I am happy that things are apparently keeping my mind occupied on being productive. FERGUSON REVIEWS will not fall into nothingness with constant delays between posts. I am making this a place to cuddle up in and stay. Grab a beverage or something and make yourself feel at home. What’s mine is yours. “Harold & Kumar” Should’ve Stopped While They Were Ahead. R, 102 minutes, Warner Bros. When the film Dude, Where’s My Car? came out a few years ago, I went to see it. I still have no idea what made me want to go and pay for a ticket to see a movie with such a ridiculous name and no premise at all, but I did it. The movie was indeed a worthless piece of trash, although I won’t deny that I chuckled a bit on occasion. It failed to deliver any kind of consistency in its nothingness, because I definitely wasn’t holding the fact that it had no story against it, for good stupid comedies do not necessarily need one. This brings to mind the next film from the same people that brought us that movie, a film with an even longer and equally idiotic title, Harold & Kumar Go To White Castle. The two movies are essentially the exact same in every way: two hammerhead guys (although Harold & Kumar at least have some brains) go on a random, pointless journey through a world that basically exists nowhere but inside the film itself and with a destination that truly defines what it means to be a slacker. What they did wrong in Dude, Where’s My Car?, they did surprisingly right in White Castle, and in spades. Harold & Kumar was so frequent with all the right ingredients for a great slacker comedy that I’d go so far as to include it on my top ten surprisingly great comedies of the last five years. Needless to say, the film’s hilarity came out of left field. Developing a stellar following after the first Harold & Kumar was released to video, it suddenly became more and more possible for fans of the characters to anticipate their story go on someday. I, for one, was very happy to hear that Harold & Kumar Escape From Guantanamo Bay was actually going into production. Four years later, the two are back, and in the opening seconds of the sequel we are welcomed back in a classic way, in the very same spot where we left them last. The introduction in this second film was very promising and had me extremely excited and anticipating nothing less than another frequently funny ride with the guts on an excursion into Amsterdam. From the second the opening titles emerge, which are just after the opening sequence that worked so well, the film is almost entirely a monumental misfire, and certainly when comparing it to the first film. The biggest problem with the sequel, what really makes this a tragic disappointment is the fact that there is virtually no time spent in Amsterdam at all…there is maybe a maximum of four minutes there. Why would they completely ignore placing Harold & Kumar on a quest to the land of legal marijuana? Why would this be entirely wiped out when the end of the first film promises us this? Aside from my major problem with the omission of Amsterdam, the movie is just plain trying too hard and overdoing it this time. I could’ve gotten over the sans-Amsterdam thing had the movie still been consistently funny with the direction it was taking, but all this film could muster was a select few moments of humor. John Cho and Kal Penn are still having a lot of fun and can manage to continue priceless chemistry together, but it’s abundantly clear this time around that they are in a struggling fight with a script that is constantly missing the point, which is to have no real point. The writers spend way too much time attempting to give back story, plot, and boring supporting characters significant time, when the whole point of seeing a Harold & Kumar movie is to watch these guys meander around making bad decision after bad decision. I’m sure fans of the first will accept this film for what it is and like it just because they’re so happy to see them back in action, which is what I was totally prepared to do until I found out just how lackluster the whole thing was thrown together. The franchise is going to end here, and rightfully so – or at least it should be. I will not complain too much, because at least the first film was such a surprisingly good one, which will forever be a remarkable thing. To this day I still cannot fathom that a movie called Harold & Kumar Go To White Castle was even made, let alone made into an extremely good comedy.